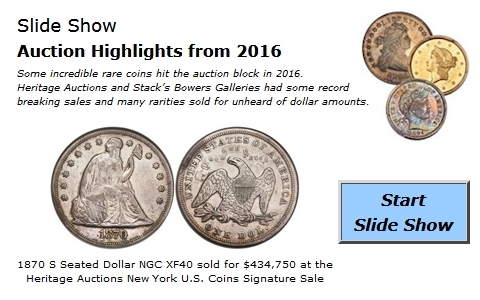 �����Legend Rare Coin Auctions held their first New Orleans sale last week, a long way from their usual Las Vegas venue. The highlight of this sale was the 1879 $20 Gold Quintuple Stella in PCGS PR64 Deep Cameo; this Pattern has been traced through the estates of Brand, Carter, Trompeter, and Simpson. It is the second finest known of just five coins in this rare Gold Pattern. The price realized was $1,880,000. Below are some of the other highlights from this top-quality sale. 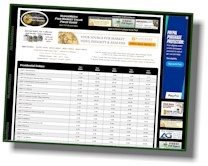 �����This week�s HD Wholesale Market Dealer Price Guide contains a variety of adjustments for Early Half Dollars through all of the Classic Gold denominations. There are discounted Market prices throughout the charts but there is an encouraging number of increases reported. The 1795 Flowing Hair Half Dollar in MS62 is up to $53,500 Market and the 1807 Heraldic Half in MS65 is higher at $56,500. 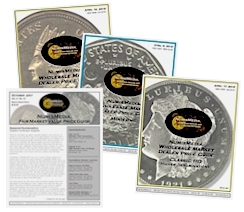 �����There does not appear to be any less demand for the Barber Half Dollar series, however, there are quite a few price adjustments to the downside. Buyers want bargains and many dealers are in the mood to reduce their inventories. As a result there are several declines in the MS62 through MS66 dates. Of course, this makes the value of the sets somewhat less as well. The Market for the complete MS65 set is down to $372,250 and the MS66 set, if you can find one, is lower at $684,200.